Homelessness affects approximately 140,000 veterans annually, according to Dennis P. Culhane, PhD, director of research at the National Center on Homelessness Among Veterans for the VA and the Dana and Andrew Stone Professor of Social Policy at the University of Pennsylvania. On any given night, he adds, roughly 60,000 veterans are without a home. But these numbers are on track for a positive downward slide after having already fallen dramatically in the past six years. While not all agree it’s attainable, experts concede significant progress has been made toward a goal set by Eric K. Shinseki, secretary of the VA, to eradicate veteran homelessness by 2015. An array of housing programs, dedicated outreach, a housing-first approach, and homeless-specific services provided by the VA are hammering away at the statistics, Culhane says. But for many veterans, mental health issues, including those related to PTSD, substance abuse, depression, anxiety, and other disorders are the obstacles to finding and keeping secure housing—in addition to a lack of affordable options and social and economic disadvantage. Culhane says people with severe mental illness who do not have disabilities related to military service typically live on a fixed income of roughly $640 per month and can’t afford housing in the private market. Added to that, he says, a mental health crisis also may cause people to lose housing, perhaps by creating problems with landlords or family members, or as a result of extended hospitalizations that prevent them from making the rent. Mental health issues not only contribute to homelessness but also may be consequences of it, says Keith Armstrong, LCSW, a clinical professor in the department of psychiatry at the University of California, San Francisco (UCSF) and coauthor of Courage After Fire: Coping Strategies for Troops Returning From Iraq and Afghanistan and Their Families. Some veterans, he notes, have no significant mental health issues until, and as a result of, becoming homeless. Sometimes, it is both. He poses, for example, a scenario of a veteran with psychological problems consistent with a diagnosis of PTSD who may not be able to take care of the basics in life, such as paying bills. He may use what money he has on gambling, drugs, or alcohol—avoidant coping strategies to protect himself from the memories of his war experience. The combination of substance abuse and trauma exposure, Armstrong says, can lead to homelessness, and once homeless, the vet may become depressed, and a cascade of psychological problems can occur. One of the major obstacles to seeking help for the mental health issues that contributes to homelessness is stigma, according to Shaheen. Issues of military identity and culture as well as fear of discrimination may stand in the way of veterans seeking available help or being receptive to outreach efforts. Among the solutions targeting these problems, in addition to dispelling the shadow of stigma, is the Housing First model, along with bold federal initiatives that integrate social services to address mental health issues. Traditionally, individuals with substance abuse or mental health issues received temporary residential treatment followed by housing. Experts and agencies agree that the Housing First model, adopted by the US Interagency Council on Homelessness, the VA, and the Department of Housing and Urban Development (HUD), which provides individualized treatment after putting veterans in homes, offers homeless veterans—particularly those with mental health issues—the best chance to get off the street and stay off. According to Shaheen, “The VA has been doing a very good job through its Supportive Services for Veterans and Families Initiative” to address the problem. The new program has earmarked $300 million in grants for the fiscal year 2013-2014 funding cycles to consumer cooperatives and private nonprofit organizations that provide services to help stabilize housing for very-low-income veterans. Culhane says the aim is to get 100,000 veterans out of shelters and back into housing, help them pay for first and last months’ rent plus security deposits and moving expenses, assist them with the housing search, mediate conflicts and debt issues with family members, and connect individuals with sources of treatment. Armstrong says, “The VA is doing a tremendous job of actually outreaching to veterans by creating [the] Supportive Housing [HUD-VASH] program and doing all it can to bring people in.” Congress has authorized 60,000 vouchers that the HUD-VASH program is providing to homeless veterans to supplement rental payments, and the VA is contributing the case management services and the treatment teams to help people get into the units and hold onto them, Culhane adds. While the VA has worked hard to get veterans off the streets, it can’t and shouldn’t carry the lion’s share of the burden, according to Armstrong. Years ago, he observes, combating homelessness was the job of local communities, but the VA stepped up to shoulder the effort. Shaheen agrees that the solution is multilayered. It requires not only employers willing to hire vets transitioning out of homelessness and businesses downtown partnering to help but also cooperation among all the helping parties. “The best approach involves an integrated model of treatment and support. 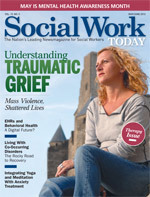 The social worker, peer support people, clinicians, employment staff, and housing specialists all need an equal voice in that model and to be trained in understanding how systems and services intersect and how employment best practices are delivered,” he says. Shaheen adds that since unemployment and underemployment is one of the root causes of homelessness, a Housing First strategy also should be accompanied by a “work fast” strategy. “Both are essential in ending and preventing veteran homelessness,” he says.